The black strip of price based S/R numbers are the key data described in these data sheets, these numbers are not calculated they are based upon analysis of swing lows across multiple time frames. 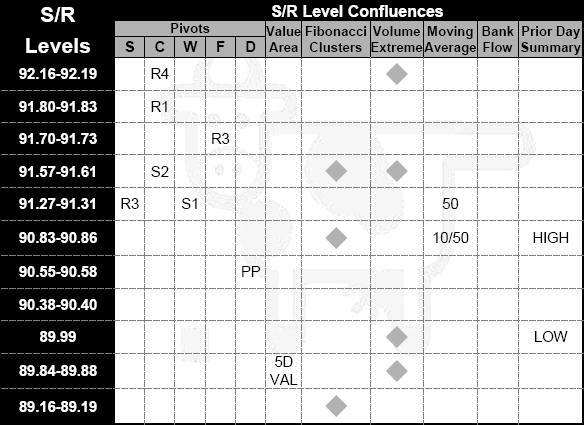 The sheet is structured around a central ‘S/R level Confluences table’ encircled by multiple peripheral data tables which feed into the central table. The peripheral tables help traders to add probability to potential price based S/R areas. Importantly all peripheral data sources such as Fibonacci Clusters, Volume Extremes etc, can be used completely independently of the main table. The information in this sheet is to be used solely as a guide, varying market conditions, news and volatility must be gauged by the individual trader. The ‘TPO Value Area’ data is derived from Market Profile; the data described is created from the profile of the previous day’s price action. It defines the value area i.e. the area in which price spent 70% of its time, the high of this 70% range being the VAH and the low being the VAL . Importantly the POC as described, is the price point that was most heavily traded and offers a key point of reference for trading. The ‘Virgin POCs’ is data created from the Volume based POC (Point of Control) of previous trading days; it is related to the ‘Volume Density Extremes’ data, in that it is volume extreme based, however it is based upon individual trading days, rather than cumulative volume data. The POC is the price at which the highest amount of volume was traded that day, Virgin POCs are POCs that price hasn’t retested since their formation, thus offering an increased possibility of being ‘filled’ in future price movements. The ‘Bank Flow Levels’ describe data where bank and institutional activity is likely. 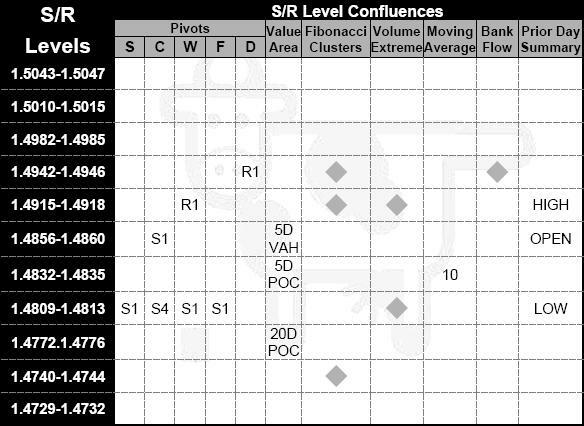 The data we describe in the Bank flow levels table is gathered from sources within banking circles. We cannot guarantee the accuracy of this data, as such it should be used as a guide/reference area. 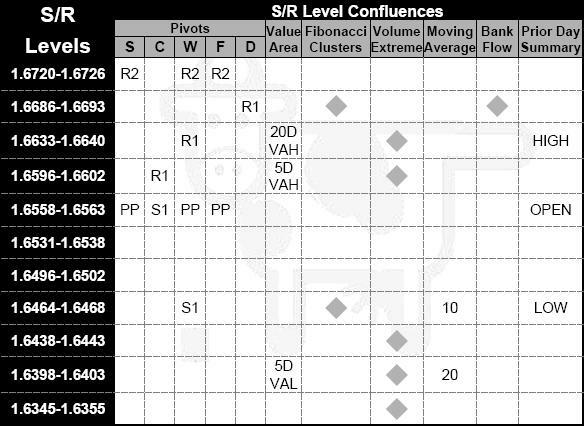 The ‘S/R Level Confluences’ table is the single most important element of the Pivotfarm data sheet, the levels described on the left hand side of the table are defined by price and offer high probability areas for price reversal. The rest of the information is derived from the peripheral tables that surround the central table. They offer confirmation and confluence of the S/R levels and help users to determine when other market participants using that particular piece of information may be entering the market. The ‘Key News Events’ table describes scheduled market events that are likely to effect the trading session, not all scheduled events are included, only events that are key and likely to have an effect are included. The ‘5/20 Day Value Area’ data is a version of the ‘TPO Value Area’. It defines the price points between which 70% of price action has occurred in that time frame. The ‘VPOC’ data describes the Volume Point of Control for the previous trading day. The VPOC is the price point at which the highest amount of volume was traded that day.